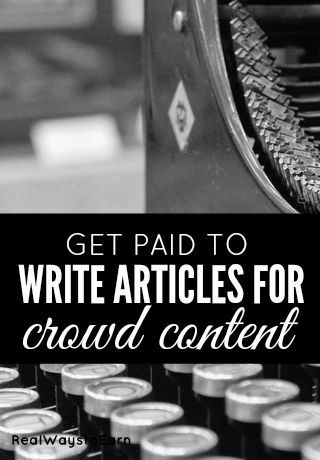 Writing From Home for Crowd Content – Get Paid Twice Weekly! Published May 3, 2013 By Anna T. This post may contain affiliate links. Regardless, I only recommend sites I've researched and/or used and trust. Crowd Content is a new writing site that everyone seems to be talking about on the forums. I've done some researching on it, and it is set up a lot like Textbroker in my opinion. I am personally a big fan of Textbroker and use them on occasion as one of my backup work from home “eggs” in my basket. 🙂 But I know not everyone likes these kinds of sites. Currently Crowd Content is accepting writers from the US, Canada, UK, & Australia. If you are not in one of the those countries, they encourage you to apply anyway because they may have work for you at a later date. There are two different rates shown. The first is called the “Street Rate.” This is the flat rate per word for writing the article. The second rate shown is a “Bonus Rate.” You can earn this rate for the article if you deliver a quick turnaround time. The client has three days to accept your article. If it's not accepted within three days, it gets auto-accepted by their system. Related: FREE list of 200+ writing niches! Payments are made via Paypal and you get paid twice weekly. You must have at least $10 in your account to qualify for a payment. If you don't have at least $10, your balance will roll over to the next pay period. For other companies that pay frequently, you may want to check out this list of weekly pay work at home jobs. If you sign up as a writer, this is the kind of content you may have the opportunity to create. The star rating at Crowd Content is similar to the writer level system many other content creation sites have in place. After being accepted, you are assigned a star rating. Your star rating will go up or down depending on the last five ratings you've been given by clients you've written for. Clients are asked to rate you after accepting your work. They can choose from: Exceeded Expectations, Excellent, Good, Acceptable, or Poor. The average of your last five ratings is used to determine what star level you are writing at. Keep in mind that you are not rated by Crowd Content — just the client. So the rating you get is based entirely on what the client thinks of your work. It's also worth noting that the client doesn't have to rate you at all if they don't want to. In addition to star/quality levels, Crowd Content has something called “Experience Levels.” These will go up as you do more work for them, but they don't offer you any extra money at this point in time for gaining in experience. If you write for Crowd Content, you have the opportunity to claim more than one article at a time! This is one of the things I don't like about Textbroker — not being able to claim more than one article, so I was happy to see that it's possible to have more than one in your queue at Crowd Content. As a new writer, you can only claim one article. But it's possible to claim up to five articles depending on how many you turn in consecutively with no strikes against you. If you turn in five orders with no strikes, you can move up to claiming three orders at once. Ten orders with no strikes against you means you can then claim four. And finally, turning in fifteen consecutive orders with no strikes gets you to the five order at a time limit. Crowd Content has a three-strikes-and-you're-out system in place. There are three violations that can get you strikes. These are claiming an order and then dropping it after their 30 minute drop window, letting a deadline expire, and letting a revision deadline expire. After three strikes, your writer account is permanently closed. The site is very clean, well-designed, and easy to navigate. It seems like a fun “atmosphere” for writing online. One thing I have observed is that the people behind Crowd Content are active members over at the WAHM forum. They were being discussed at length in the freelance writing sub-forum, and they chimed in on several of those posts answering questions, addressing concerns, and so forth. I always like to see this — especially with a young company such as this one. With so many other work at home companies, it seems like you are dealing with “Oz behind the curtain” when trying to get in touch with anyone in charge. I really like to see companies that just dive right in there and start conversing with workers and potential workers. Kind of makes you feel like you aren't dealing with some anonymous entity. If you want to know more about Crowd Content, you can probably find the answers you're looking for in their very thorough Writer's Guide. Because Crowd Content is being discussed on forums — and responding to this discussion themselves, there is a lot of useful feedback. So far, the company is paying on time. As is typical with most content sites, some are unhappy because they do work for clients who are difficult to write for and give them unfair ratings. But this is going to happen sometimes no matter what site you use. I also saw one person mention that he/she did not like the TAT (fast turnaround time) bonus that Crowd Content has in place because it makes for a “rushed” feeling when writing the article so you'll qualify for the bonus. I think I wouldn't mind that, but I get where this particular person is coming from. I would also recommend checking out the reviews on Glassdoor for the freelance writing jobs at Crowd Content. Crowd Content is not always open to registration. They want to have enough work to go around for their existing writers, so they are being careful not to take on too many people. You can check this page for openings, and you can put yourself on a waiting list if you want to be contacted for future openings. This is the most profitable route to take as a freelance writer. You can get your own clients and set your own rates, which you cannot really do with Crowd Content or other content sites. A six-figure income is not outside the realm of possibility when you're running your own business. She's also written an incredibly detailed guide on working for yourself as a freelance writer if you're interested in getting a lot more information on how to go about starting your own freelance writing business. I was accepted at Crowd Content at Level 2 (I am Level 4 at Textbroker). I am disappointed that when I get an email that there are jobs available and click on the link, the jobs are already gone. I’ve been with Crowd Content for the past month or so. The jobs are sparse. Also, the rates quoted above are not correct. I’m a 4-star writer and I average 3-4 cents a word. I applied for Crowd Content and just got accepted. They gave me a 2 star rating which I feel is a little low since I used a sample that had been accepted at similar sites for 4 stars, but perhaps this is the only level they’re looking for at the moment. Regardless, there were 0 jobs for any level available when I checked this morning, though they mentioned how they are expecting big volume orders soon. I think I’ll check back periodically but I’m not really expecting too much from this site. Hi there, I hope I can reactivate this thread. I just applied for Crowd Content, submitted a sample, and am waiting for approval. Does anyone have an update to post? Hi I am new to Crowd Content and enjoy writing for them so far. I was able to make more in one week than I usually make on Textbroker. Was wondering if anyone knew around what time of day payment is usually posted? It is always nervewracking before you get the first payment! I was on the waiting list. I came home late one night to an email stating that they were accepting writers. I have been writing for the low paying site and churning it out. I get mostly 5 star ratings there. When I wrote my application piece, I let my creative juices flow and was hired in at a higher level. I have access to articles that pay rather well. I am still new and am not even thinking about the TAT. Those bonuses will come later. I’m writing the best stuff that I can to see how it gets rated. So far, I feel that they have been fairly accurate. Once I am getting 5 star ratings there on a regular basis, I’ll start working on the TAT and the bonuses. I really like this website. It is intelligently designed. I needed to take the next step forward to be able to move forward with my writing career. I love that they restrict the number of writers. It keeps me motivated to continue working and delivering really quality articles. My Crowd Content application got denied. My writing didn’t match their needs. It says you can try again in three, but not sure if I want to. Hi. I just got accepted by Crowd Content and they base your initial rating on the quality of your writing sample. I made it in with an initial rating of “3” but I am an experienced writer and can write superior content quickly. They also told me in an email it is rare for them to rate writers with a “3” initially. But you can always move up with good reviews from clients. Congrats on getting in at a high rating! I hope it goes well for you, feel free to come back and share your experience once you get started. I made over $14,000 in one year on the site. Despite the occasional hiccup, they are the best online content site in my opinion. I got to write for some prestigious magazines thru them too like Forbes, etc. Wow, you are rely getting that much work? I submitted a support ticket because there is nothing every listed when I click on the “Available” tab. What areas are your expertise? Hi everyone. I just had to come in and update my post. I DID make a lot of money on Crowd Content in the past and stayed at the top writer status for over a year. But if you get dropped to 3 rating or below, it’s hard to make as much. They also drop you even when it is due to misinformed clients who just want to sabotage your rating or don’t want to pay the rate you are supposed to get at the highest level. Also, Crowd Content has changed their business model, so it is EXTREMELY hard to grab the articles before anyone else does. Since I kind of stopped writing for CC, my income has come up from $3000 per month to over $8000 per month and growing. How did I do it? By weaning AWAY from the content sites and grabbing my very own clients. That’s what the best writers always end up doing. I’ve appreciated such legit sites like CC (and they ARE legit) and pay like clockwork, but it’s like fishing having to wait on articles to roll in and hoping your connection is fast enough to grab them before anyone else does. So while at one time the best decision I ever made was to join CC, NOW the best decision I ever made was to leave them. And, for that reason, I’m out! Out of curiosity, I was cruising the Mturk site. There are a lot of jobs posted by the requester Crowd Source and Crowd Flower. Does anyone have feedback for these entities? Also, I seem to be doomed in the writing area, as I am an academic writer and not a journalist. Any tips? Crowd Source is the same as write.com. Take the writing tests there and it will eventually direct you to MTurk. You can bypass the shenanigans on write.com and request a writing qualification directly on MTurk from Crowd Source, if they have any available. There are a huge number of reviews of both Crowd Source and Crowd Flower from Turkopticon. You have to register to use the plug-in, but it’s the best resource for info on MTurk employers, and updates daily with reviews. Crowd Source is notorious for untrained, unprofessional editors and Crowd Flower is even worse, although there’s quite a few great reviews from folks who like writing for Crowd Source. Do study the style guide in-depth before trying to complete the writing test for them. Proceed with caution. As for academic writing, there’s plenty out there to be found! Search on “academic writers needed” and you’ll see what I mean. I actually went the other way. When I first started freelancing, I did academic writing. I now prefer writing for businesses and mostly avoid academic writing. Crowdsource is NOT recommended by this writer! They are a factory model “socialist” platform at best in my opinion and they overlook great writers in the search for mediocre content that fits their standards of what they THINK is good writing. Steer clear from CrowdSource. It’s just a training ground of poor editors. I was accepted as a 3 star writer a week ago. So far, there hasn’t been any work. Huge letdown! The company did respond quickly to my application, appear to have experienced editors, and seem professional. All of which is more than can be said for CloudCrowd. Crowd Content Update: I did manage to snag a few writing jobs in the six weeks since my previous comment. I was paid the correct amount and on time. I really like the design of this site. I pay no attention at all to the TAT bonus times because there’s hardly any work available. If there were steady work, the concept would be nice. So I’m usually already doing something else when I see a job that I like and accept it – I can’t generally stop what I’m doing just to meet the TAT bonus. This is a very minor negative to me. This site has a lot of potential. I hope that it gains more good clients and doesn’t accept clients that pay low wages. Hi Anna! Thanks for the excellent review. It’s very detailed and accurate. Yes, unfortunately, we are not accepting new writers at this time. We were accepting 1 Star writers up until recently, but we are now adding writers to the waiting list for all quality levels. You hit the nail on the head; we’re trying to manage our supply and demand levels so that the existing writers have enough work to stay motivated. This is a very tough balancing act, to say the least! Our main focus at Crowd Content right now is upgrading the client side of our website. We recently put all our efforts into creating a new and fully featured “writing environment” which is what you see now if you sign into Crowd Content as a writer. The client side is still very basic and has not been upgraded since the early days of Crowd Content. We’re adding features that make it easier for clients to manage their content ordering process. We’re also making it easier to communicate and work with writers. We have big hopes for the client upgrade and anticipate its release to attract many new clients. It should also encourage existing clients to order more content from our writers. As we see this trend take place, we will be opening the doors for new writers and start focusing on growing our writing team again. Thanks again and stay tuned for the new client interface release later this month! Thank you, Clayton. I’m so glad you liked the review. Also thank you for the additional information! Well, I went ahead and applied. Always good to get in at the ground level on a new site I guess! Hopefully, I can advance to a higher level later! I’m guessing since it is a new site, there isn’t currently a lot of work for anything over a 1 right now. I just hope it isn’t like some other sites I have joined where clients place all their orders at the lowest level because those who created the site didn’t make much difference between the quality of levels. For example, they could pretty much get the same quality of writing at a 1 as they could at a 3 or 4. I applied at one site like that and was accepted at a 4 (out of 5), but there were never any orders above a 2…and even the 2’s were few and far between…while there were usually hundreds of orders at level 1. Good luck April. Please let me know how it goes for you. I thought of applying myself, but I have so much going on right now that I held off. Maybe when school is out for my boys. But I hope it turns out to be a good thing! Hi April. Which site did you apply to that has work on the lower levels? It might be a great egg to add. Thanks…applying now. They give you a choice of a few topics to write 200-350 words. But, if I’m only going to automatically be accepted at a 1, not sure. Maybe it will make a difference later though if they have openings at higher levels. Wondered the same thing, but could find no information in the writer’s guidelines about how they determine your initial star rating. They did present an example where one person was accepted at the second star level, so I do kind of wonder if sometimes it’s based on the quality of a writing sample you submit or something. But then with them saying they are only taking one star writers right now, perhaps that’s not always the case. If I can shed any light on it, I’ll update my review. That has me curious, too. Yep, they try to make sure there is enough to work go around so they don’t overhire. I think that is a good thing though. You could always apply at one star and then start trying to move up the ranks?